Mutual Weirdness: Hooray for Leftovers! Normally when a person thinks of leftovers they think of something gross and unappealing. 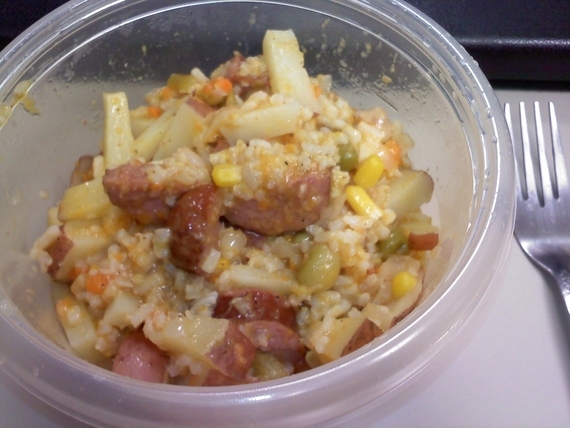 Well my lunch today was leftovers and I'll have you know it was very YUMMY! In an effort to save money on groceries because we just bought a new car, the hubby and I have been exploring alternate methods of cooking that are cheap but also not time consuming. This is what we've come up with. We don't have a name for it, but it is so very yummy and it cooks all in one pot. We start by slicing and adding the onion, potatoes, Veg-All, water and margarine and spice to taste (we like ours a bit spicy) so that they can start cooking. Then slice up and add the sausage. Once all of that is together and boiling we add the rice, cover and reduce to medium heat and cook till the potatoes, onions and rice is soft. Normally only about 10-15 minutes. And that's it! Dinner is ready! We've also made this with chicken. We started with skinless, boneless chicken breast cubed up. It gets browned in a seperate pan with some seasoning and is then added to the rest of the mix. It's hard to estimate exactly how much this cost to make since so many of the items are bought in larger packages, but it is for sure under $10 and lately we've been having enough to fill us both up for dinner with enough left for me to take to work for lunch the next day plus a bit more. We've made this a few times now, each time has been a bit different as we don't measure the spice, so some nights are spicier than others. We've also used some flavored rice side dish packs a couple of times and those work really well also for a bit more flavor. We're also thinking about how we could change it up come winter with maybe some chili beans and such.